1) Create a new Angular Application. 2) item.ts having item model definition. 3) mock-data.ts, will have a list of items. 4) use ngModel to have data binding flowing both sides. 5) Change event binding to get Checked item record. Note: install nodejs and npm in your machine. Step 2) Create item.ts file, which will have a model definition of the item we will show in radio listing. Step 3) Create mock-data.ts to list items which we will iterate. Step 4) Open app.component.html and replace HTML with below content. Note: I have added bootstrap.css v4 in index.html at the root for easy styling and also some styles in app.component.css. Here we have “onItemChange” even which will fire on radio selection/change. 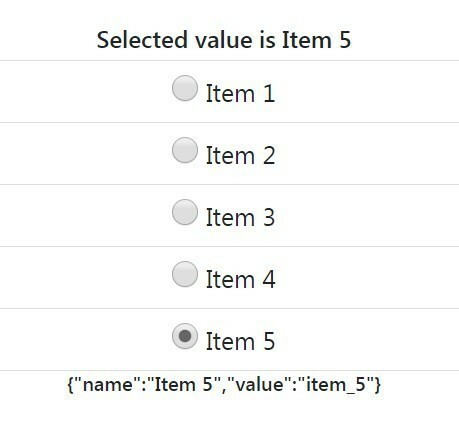 “getSelecteditem” will find the matching item from dataset ITEMS. “radioSelected” is setting default selection to “item 3”, which will show up selected on app load. Find full source code here on Github.